Internet of Things has taken the world by storm. However, there is much hype and little achievements. Most of its potential still remains untapped. If you are a startup or willing to venture with one, here are some cool IoT ideas that can help you create solutions that augment the lifestyle of people solving their challenges. The term aquaponics combines two terms. Aqua is derived from aquaculture, which means breeding and raising aquatic animals including fishes and mollusks on a commercial scale and ponics is derived from hydroponics, which means cultivating aquatic plants. Evidently, in an aquatic ecosystem, both animals and plants depend on each other to sustain and grow. Animals get oxygen from plants to breathe and plants get minerals and nutrients from the animal's waste. 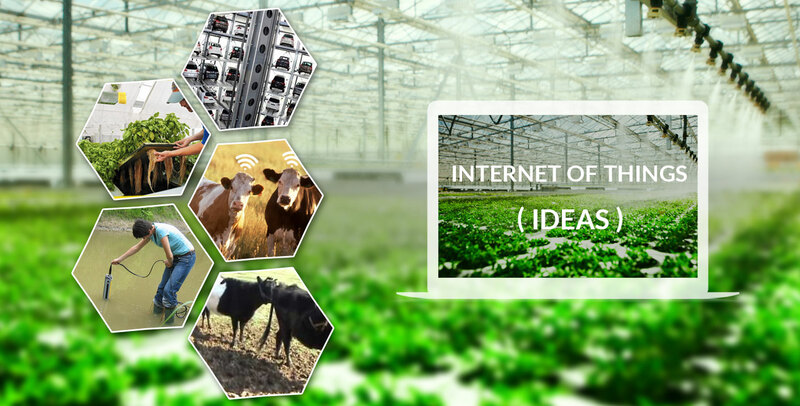 Applying IoT, you can help farmers to keep a track on the metrics associated with the quality of water, dissolved elements, PH level, and others, and hence monitor the overall health of the animals and plants. This will help farmers to contain any health hazards that can derail their productivity or financial goals. Internet of Things can help contain the unpredictability and vulnerability associated with the dairy business and improve the health of livestock, and the economy of farmers and states. Here are two possible ways. Challenge and its Impact: Predicting and detecting estrus cycle in bovine animals like cows and buffaloes is a challenge. Failures to do so impacts the fertilization and breeding of animals and, hence, the expected produce claims the Pennsylvania State University. Thankfully, rearing animals in an IoT-enabled environment and consistently monitoring their body symptoms, physical metrics, and behavior through sensors or BLE, the problem could be solved. With an Internet of Things application, make actionable data available at the fingertips of farmers. The health of animals is of paramount importance to the farmers as it affects the qualitative and quantitative aspects of the production and, hence is directly connected with their economy. According to a survey, an infection in the mammary gland (Mastitis) costs 1.7 to 2 billion USD each year to the US dairy industry. This could be challenging for your IoT developers, but you should be ready to tread the untrodden path or explore avenues that are least explored like most of the successful startups that clinched big success in less time do. Create an IoT ecosystem that makes information or data about the health of the animals easily accessible to the remote farmers. Advanced sensors can read and relay temperature, heart rate, respiration rate, stomach-contraction rate, and other body activities of the animals to the smartphone or any Internet-connected device. Getting powerful sensors will not be a challenge. The backend database can be easily managed with the IoT platforms like Microsoft Azure IoT, IBM Watson, Dell IoT, SAP Leonardo or any other. With rapid unplanned urbanization, we have created this problem for us. Whether you live in an advanced or emerging economy, you can feel its menace and impact on your life. IoT has come as a savior once again. With an IoT-enabled parking area, finding a place to park will not more be a challenge. Even if it’s not there, at least the driver will have an advance information of it. Thus, they can avoid unnecessary hassles of moving their vehicles back and forth in the quest for space. The IoT app development company you hire must know the programming skills to make the apps compatible with leading auto infotainment standards including Android Auto and CarPlay so that drivers can have the parking information right in front of them on the dashboard of the system. ECG helps professionals to read the status of the heart and is an important tool to collect the metrics and diagnose the heart problems, which can be fatal at times. By connecting the ECG device with IoT, it’s quite possible to relay or send the information to a nearby healthcare center. The IoT applications should be designed in a user-friendly manner so that consumers or patients can collect and share the data with just a tap or touch. Substandard drinking water is responsible for causing a host of water-borne communicable diseases, mostly in the emerging economies. We can’t blame on the inadequacy of water purification mechanism alone as there is obvious apathy on part of the departments and people concerned. Setting up an IoT-based water treatment or purification system can make a difference to the situation. This will make the system intelligent enough to communicate the progress of purification, the quality of end-product, i.e., purified drinking water to the authority accountable for managing the water quality or distribution of water. With digital becoming an innate element of our lives, the pressure mounts on the technology manufacturing and implementation firms to ensure that it serves the purpose well without endangering their health and wealth. Thus, a prudential and farsightedness is desirable in your approach besides the possessing and nurturing technology prowess and expertise.